How is your order prepared? Sturia caviars are stored in our cold rooms at -3° in the heart of our production workshop. As soon as our production team receives your order, the products you have ordered are immediately packaged in isothermal packaging, specially designed to ensure that the cold chain is maintained until they are delivered. The sturgeon is a protected species whose trade is highly regulated and caviar is a very fragile product that requires transport and delivery by refrigerated transport. Therefore, for deliveries outside France, please contact our customer service department who will organize your delivery or put you in contact with our authorized reseller. The shipment of your order within 48 hours. Your package will therefore be delivered to your home within 3 days on average. - Weather disruptions: Heavy snowfalls can delay deliveries, do not hesitate to contact us for any information. Following the increase in credit card fraud, we are systematically checking with banks. The shipment of your order is processed within 48 hours. 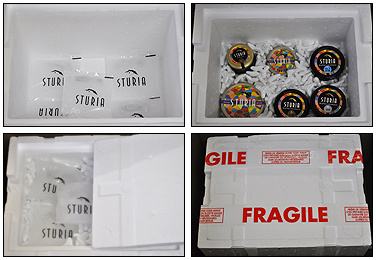 Your package will then be delivered to your home 24 hours after shipping your package, so it is advisable for Sturia customers to anticipate their order. Our carrier ensures delivery to your home or workplace the day after the shipment, anywhere in metropolitan France. Deliveries from Tuesday to Friday. No deliveries will be made on Mondays, Saturdays and Sundays, as well as on public holidays and the day after public holidays. In case of your absence, our carrier will keep your goods in a cold room to guarantee the cold chain and will represent the package the next day.